The “Tung Dok Kam Pae Lae” or the 7th Winter Fair at Muang Kaen Festival in Mae Taeng, Muang Kaen Pattana Municipality will be held from December 25, 2016 to January 3, 2017 at the Municipal Stadium at Muang Kaen Pattana and the surrounding area. 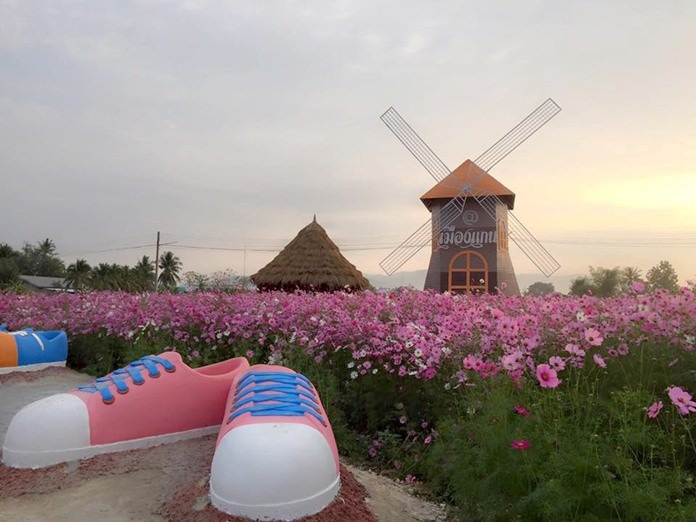 Several fun attractions have been added to the cosmos field at Muang Kaen Pattana in Mae Taeng for the Winter Fair to be held from December 25 – January 3. The highlight will be a huge field filled with blooming cosmos flowers planted behind the Municipal building last year and this year. There will also be several fun attractions to take photos on in the area Thiti Intaphan, Head of Office of the Municipal Clerk and Wipada Wanglung, Chief of Muang Kaen Pattana Municipality announced at the press conference. The field will be open before the grand opening of the fair, visitors can go take photos beginning December 20, 2016. This year, in addition to the fair, there will be an exhibit of HM King Bhumibol’s projects, a ceremony to pay respects to the Pra Jao Sam Fang Monument and the Inthakin Pillar in Muang Kaen. The lives of residents and their traditional culture and performances will be exhibited as well as a demonstration of cooking local Nam Prik Num by the Krok Luang (Royal mortar) in a giant pan, grilling the world’s longest Northern sausage and OTOP products, food, trees and plants. Visitors will be given the opportunity to visit the cosmos field via a tram and oxen drawn cart. There will be farm stays, local home stays, rafts on Mae Ngad Dam and two hundred tents for tourists to stay. Last year 200,000 people visited the popular winter fair, officials expect larger numbers this year and have prepared for the expected traffic and provided additional parking. More information on Facebook at muangkaen or call 053-857360 ext. 18 or Facebook/muangkaen.